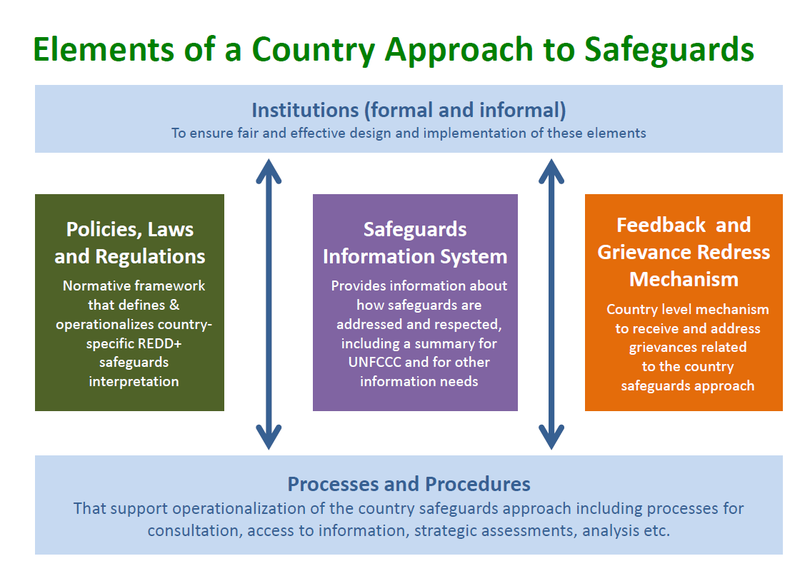 What is a Country Safeguards Approach? 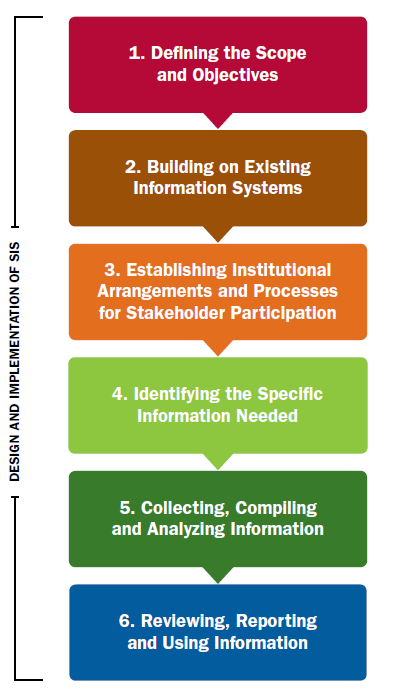 an institutional framework defining roles, responsibilities and procedures of the different entities. The country safeguards approach builds on and strengthens the country’s legal and institutional frameworks and information systems by ensuring that they support effective application of internationally and nationally agreed safeguards for REDD+. In this way, the CSA contributes to lasting improvements in the country’s governance framework, supporting not only the implementation of REDD+ but also related policies and measures. The CSA ensures that safeguards are addressed through policies, laws and regulations, which are strengthened as needed. In some cases, gaps in the legal framework can be addressed through ‘other safeguards’ existing in customary law and norms of Indigenous Peoples and local communities, safeguards in corporate policies, and procedures both of non-state and state actors. The CSA ensures that safeguards are respected, in particular through the safeguards information system, by monitoring implementation of safeguards (PLRs) and providing information that can be used to help address any weaknesses. This conceptual framework for development of CSA developed by the REDD+ SES Initiative in collaboration with UN-REDD, the Forest Carbon Partnership Facility (FCPF), World Resources Institute (WRI) and Climate Law and Policy. Identifying the international and national safeguards frameworks that will be used as an input to define the safeguards goals – such as the UNFCCC ‘Cancun’ safeguards, safeguards required by donors or funders such as the World Bank or other delivery partner, bilateral agreements or policies (as appropriate), international best practice standards such as REDD+ SES, etc. Assessing the potential risks and opportunities of proposed REDD+ strategies, for different stakeholder groups. Developing a country-specific interpretation of safeguards for REDD+ that specifies the constituent elements and key considerations relevant to the country context. For example, requiring specific attention be given to the participation of vulnerable or marginalised groups, or specifying the country’s biodiversity and ecosystem service priorities that must be maintained and enhanced through REDD+ activities.Effective stakeholder participaton helps to ensure that all potential risks and opportunities are identified from the point of view of different stakeholders, and also helps to ensure that country’s safeguards goals address key issues of concern to stakeholders. Analyze and develop policies, laws and regulations: Once the safeguards goals are defined and agreed, an analysis can be made of the legal framework against the country-specific interpretation of safeguards for REDD+. This can also include an analysis of ‘other safeguards’ such as customary norms, and institutional procedures, and their applicability to the REDD+ activities. Where gaps are found, a process should be developed to address the weaknesses. In some cases, relevant laws exist but regulations for their implementation are inexistent of ineffective. Different approaches should be considered to fill the gaps, potentially starting with development of procedures (for example Guidelines for Free Prior and Informed Consent for REDD+ activities), that can support the application of safeguards before more permanent legal reform is possible. Develop or identify a feedback and grievance redress mechanism: once the policies, laws and regulations that are relevant for safeguards for REDD+ have been identified, then the scope of grievances can be defined. Existing grievance mechanisms can be used or developed to cover the full range of issues specified in the goals of the country safeguards approach. Alternatively, a new mechanism may need to be developed, and integrated into the institutional framework. 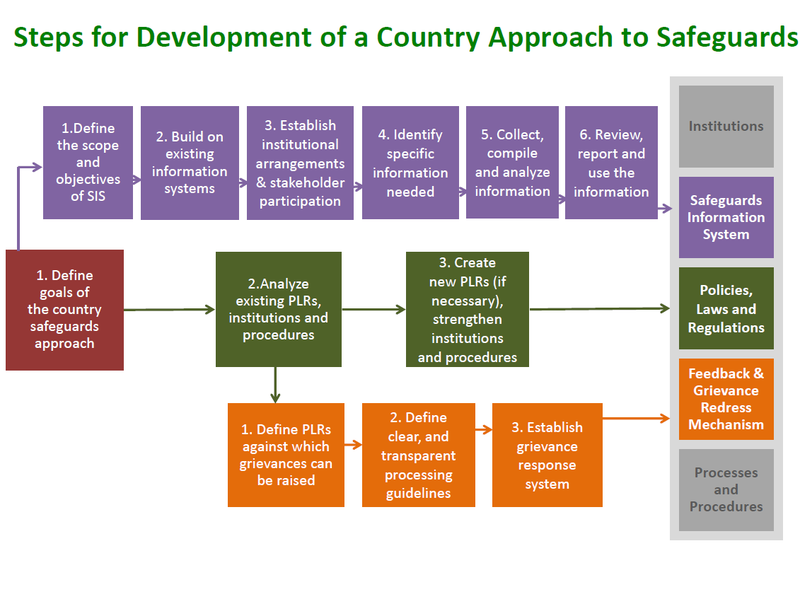 Develop a system for providing information on safeguards: The safeguards information system can serve multiple objectives at different levels including reporting internationally for results-based financing, and providing information within the country to improve the REDD+ strategy (adaptive management) and to build and maintain stakeholder and political support for REDD+. It can, and should, build on existing information systems, potentially linked to the relevant policies, laws and regulations. These different tracks and the steps within them may be developed simultaneously, or in a different order and in different ways. This framework is presented to help country actors with understanding and organisation of the potential steps, but is not intended to be presciptive.